Ribcord Vinyl vertical blinds with all washable vinyl texture. Our Brand Curved Ribcord Vinyl is a ridged vertical line of Curved vinyl just right for that apartment or rental area. All vinyl textured product that also room darkens when closed. Vertical blind window treatments provide a practical and attractive solution for controlling light and providing insulation in any room. They reflect solar heat and reduce air conditioning costs by minimizing heat transfer passed through windows. Vertical blinds manufactured by Mariak offer a complete line of solid, perforated, textured, and embossed PVC louver patterns as well as several of the best selling stitch bond fabrics. In addition to a wide array of colors and patterns, a variety of valance and control options are available. The PVC louver materials contain UV inhibitors and provide room-darkening opacity to block sunlight. Standard vertical blind louvers are rotated by pulling a beaded chain and are drawn open by pulling on a nylon cord. The wand control system replaces a standard cord and chain control system with a heavy-duty fiberglass wand that rotates the louvers open and closed. 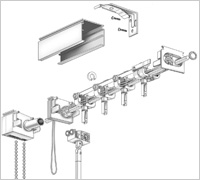 In addition the wand unit also moves the louvers along the blind headrail traversing the blind to the open position allowing full view of the outside or closed. This feature provides for added child safety eliminating all cords and chains that could cause strangulation. Installation instructions are always included in the packaging and if you have any questions call us at 1.800.836.4488 or email us at info@blindsexpress.com.